The vibrant night culture of Seoul serves as the perfect backdrop for hungry travelers to fill their empty stomachs after a full day of exploring. Night buses in operation throughout major areas provide travelers with the best means of enjoying a late night tour without having to worry about excessive cab fares for the return trip. Read on to learn more about these late night tours to discover more fun and great eats by riding on a night bus! What is a "Late Night Bus?" Late night buses in Seoul refer to buses operating from midnight to early dawn. These buses are a great way of moving around town on public transportation during the hours when most buses are not in service. As of January 2019, nine late night bus routes are in operation with various timetables. Each bus route starts with the letter “N” to signify it is a night bus. These late night buses cover the high traffic areas around popular tourist areas such as Gangnam Station. The fare is a bit higher than day buses, priced at 2,250 won when paying with cash. 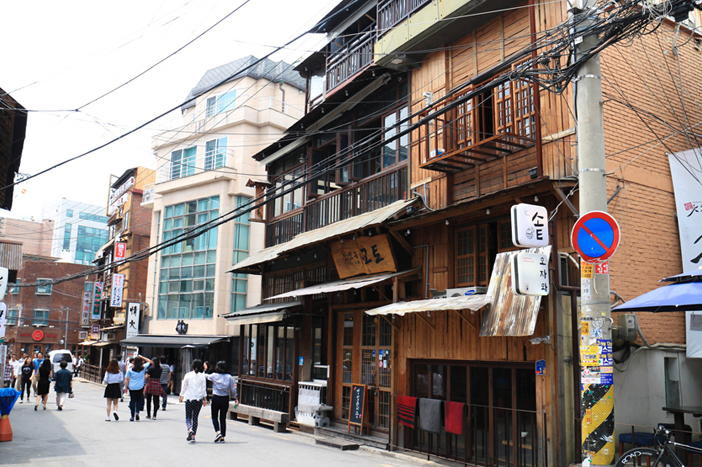 The alleyways of Hapjeong-dong are a hip and artistic zone, dotted with dozens of vintage coffee shops and dessert cafés. Hapjeong-dong Café Street in particular is lined with cafés and cultural spaces of varying themes, all vying for the attention of passersby. More than just cafés, Hapjeong-dong Café Street also has pubs, wine bars, and restaurants serving a blend of Eastern and Western cuisine. The mix of cultures and styles has created a unique atmosphere. 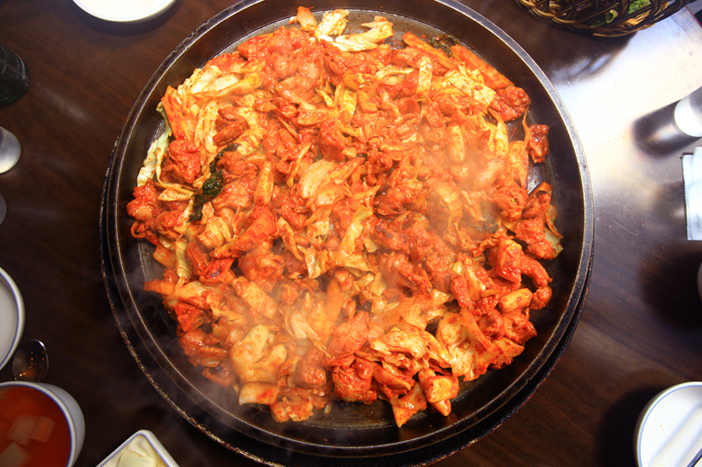 Sinchon is becoming well known for delicious dakgalbi (spicy stir-fried chicken) through word of mouth among epicureans. 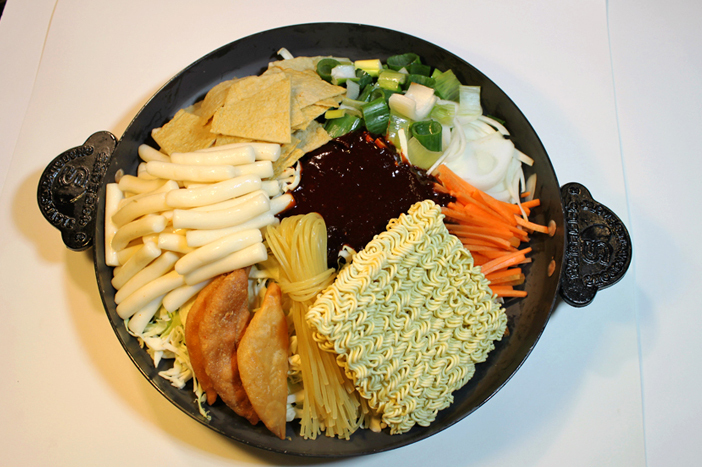 Dakgalbi is a dish made of chicken and a variety of vegetables including cabbage and onion that is covered in a spicy seasoning and stir-fried at the table in front of you. In bustling Sinchon, restaurants specializing in this dish are thriving, including restaurants selling cheese or seafood combos and even some all-you-can-eat! With the many dakgalbi and fried chicken restaurants in the area, Sinchon is a must-visit place for lovers of chicken. 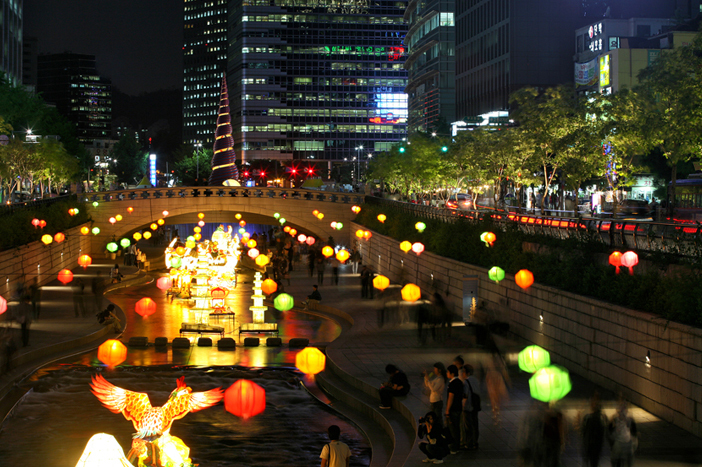 The paths along Cheonggyecheon Stream are full of visitors all year round. The stream is dotted with people escaping the heat of summer or coming to view the colorful lights during the Seoul Lantern Festival in fall. Cheonggyecheon Stream is lined with cafés, making it easy to stop for a cup of coffee while enjoying a relaxing view of the stream. Dak Hanmari Alley in the area of Dongdaemun Shopping Complex is lined with restaurants specializing in dak hanmari (whole chicken soup). 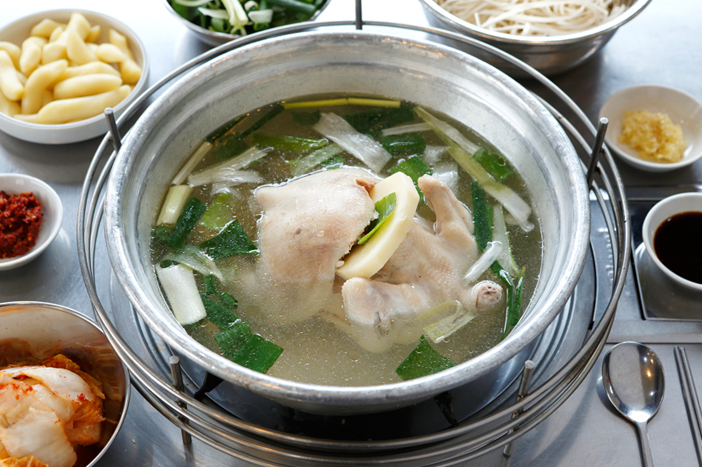 For newbies to Korean food, dak hanmari may seem quite similar to samgyetang(ginseng chicken soup). However, while samgyetang is a single dish, dak hanmari is a full course! A whole chicken is boiled in a broth along with leeks, tteok (rice cakes), potatoes, and more. Spicy gochujang (Korean chili paste) can be added according to one’s tastes. After finishing the chicken, kalguksu (noodle soup) is cooked in the remaining broth. With such a hearty meal, it will be your own fault if you leave the table feeling hungry! It’s easy to find pojangmacha (food stalls) on the streets of Dongdaemun at all hours, as the wholesale fashion market is open until the early hours of the morning. 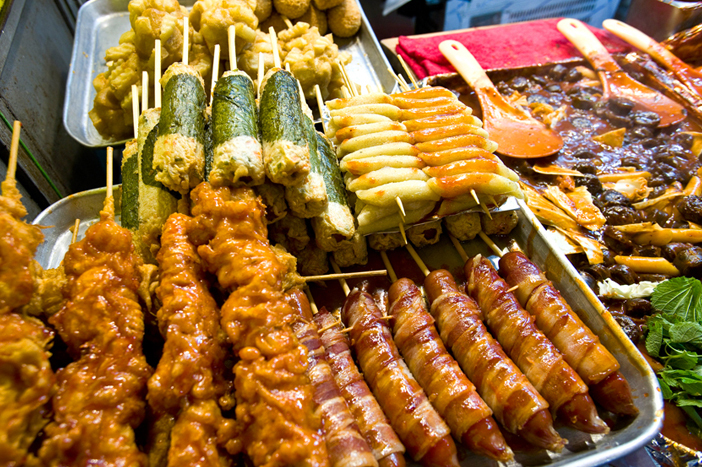 Among the variety of late-night snacks available, most foreigners prefer dak kkochi (chicken skewers), tteokbokki (spicy rice cake), and sundae bokkeum (spicy stir-fried blood sausage & vegetables). Dak kkochi are made by skewering pieces of chicken and spring onion onto a stick, which are then grilled and coated in either a sweet soy sauce or a spicy seasoning for a taste loved by all. Another popular food is mayak gimbap, literally translated to “narcotic gimbap” because it is addictively delicious! Try it dipped in spicy tteokbokki sauce to see what all the fuss is about. Those in the know will tell you that Yeonsinnae is synonymous with kalguksu due to the high concentration of food stalls selling kalguksu in the area. Kalguksu is a bowl-full of handmade noodles that substitutes for a single meal. The thick noodles in eomuk (fish cake) broth and spicy seasoning make the perfect late-night meal to appease your appetite. 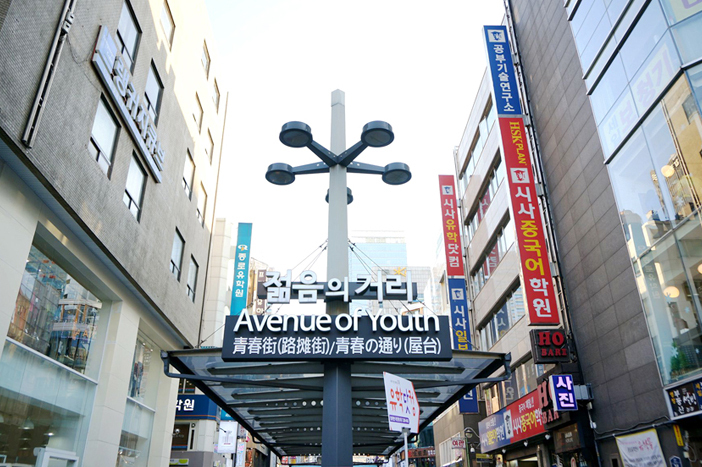 Lit up as bright as day all through the night, the Avenue of Youth at Jonggak Station is the top spot for enjoying Korea’s night life. Visitors can get their first taste of the Korean drinking culture at the pubs here. There are also many restaurants serving various foods from samgyeopsal (grilled pork belly), galbi (short ribs) and other barbecued meats to chicken, kimchi jjigae (kimchi stew), jeon (pancake), hoe (sliced raw fish) and more. All you have to do is decide what delicious Korean food you want to eat! Garak Market is the nation’s largest agriculture and marine products market. Fresh vegetables, fruits, seafood and other products are brought directly to the market from the countryside and sold in auctions from evening until dawn. If you’re looking for a unique experience, watch the auction process taking place so fast that it will leave even bystanders breathless trying to keep pace. For dinner, visit the marine products section, where you can pick the seafood you want to eat at prices cheaper than anywhere else in the city. There are many bars and pubs to choose from in the Hongdae area, the center of Korea’s youth culture. 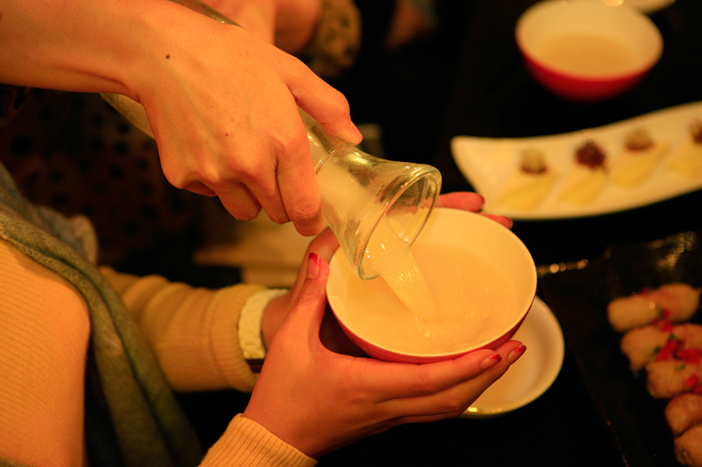 For a unique Korean experience, why not try one of the bars selling makgeolli (rice wine)? 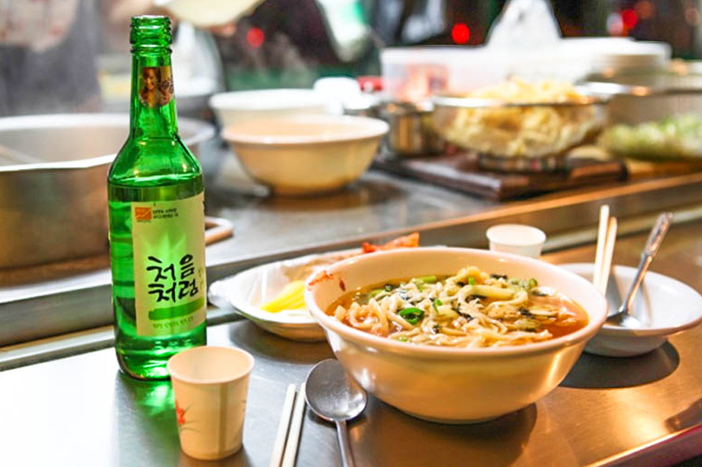 With a taste and alcohol more similar to a beer than soju, makgeolli is a popular drink choice. Because of the lower alcohol content, you can enjoy a larger variety of flavors, from makgeolli sweetened with honey to fruit makgeolli. 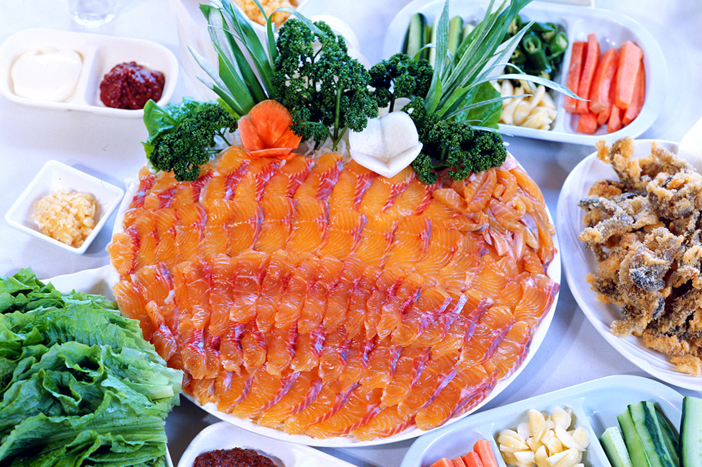 Pick a side dish to go with your drinks and enjoy your Korean nightlife experience! Sindang-dong Tteokbokki Town has been well-known for tteokbokki since the late ‘70s. Many of the food vendors here remain open 24 hours so you can find people enjoying the sweet and spicy snack at all hours. The shops all have their own sauce, making the taste unique to each vendor. They also sell sets with toppings to choose at will such as eggs, ramyeon noodles, mandu (dumplings), fish cakes and more. Choose your favorite toppings and chow down! 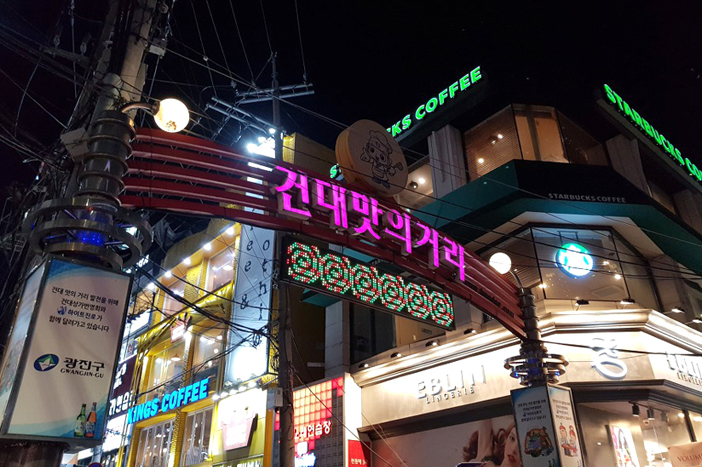 All kinds of food are available at Kondae Food Street, from Korea’s beloved grilled samgyeopsal and galbi to Western foods and trendy dessert cafés. The restaurants and cafés remain open late into the evening, drawing customers into their bright and warm interiors.